Efficient and smart, the Toyota RAV4 Hybrid is a crossover SUV that offers premium interior amenities. In addition to having leather-appointed seats, this model boasts awesome digital technology in the signature Entune infotainment platform. A 7-inch touch screen with the Entune technology is available in the Toyota RAV4 Hybrid. With a few simple taps of the display, you can access GPS navigation software and other digital features. Compatible with iPhones, Siri Eyes Free is ready to respond to your requests in real time. If you'd like to know the latest traffic conditions, just tune into the HD Radio Predictive Traffic channel. Additionally, the Doppler Weather Overlay application is included in HD Radio. The audio system in this hybrid crossover SUV is available with 11 speakers by JBL GreenEdge. 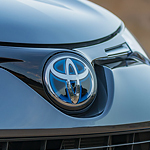 The Toyota RAV4 Hybrid is available for sale at Riverhead Toyota, which serves auto buyers in Riverhead, NY and other adjacent communities.